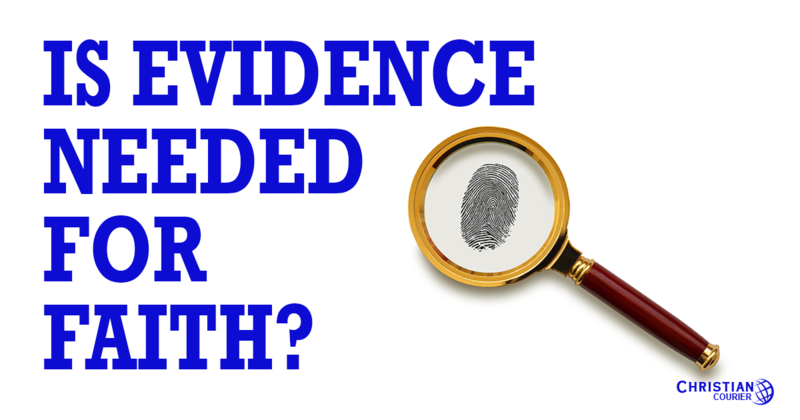 Is Evidence Needed For Faith? Some folks believe that in order to have faith in Christ, you must examine certain evidence and draw a conclusion. Others object, suggesting that if you have to have “evidence” to believe, faith really would not be faith at all? For instance, some will argue that Christ’s resurrection is something that must be accepted by faith alone ... that there is no real evidence for such. In this connection, they contend that the Gospel accounts are nothing more than hearsay, and no physical evidence is available. With all due respect, this complaint reveals more about the mind set of its supporters than anything else. Second, it demonstrates a bias against the New Testament documents as valid pieces of evidence. The gathering of evidence is a process involved in almost every endeavor of human activity. It is a part of the way the human mind was designed to operate. Evidence is collected; then it is analyzed. Finally, logical conclusions are drawn, which permits action to be implemented. Without evidence the auto mechanic cannot determine how to repair an automobile. Without evidence the physician cannot diagnose and remedy an illness. Without evidence a criminal cannot be convicted of a crime. Is it reasonable to believe that the greatest question of human existence — “How do I get to heaven?” — is void of any evidential support? Such a conclusion is illogical, much less is it scriptural. Evidence and belief compliment one another; they are not mutually exclusive. Evidence prepares the way for belief; belief does not exist independent of evidence. Let’s consider the following examples. “For the invisible things of [God] since the creation of the world are clearly seen, being perceived through the things that are made, even his everlasting power and divinity; that they may be without excuse: because that, knowing God, they glorified him not as God, neither gave thanks; but became vain in their reasonings, and their senseless heart was darkened” (Rom. 1:20-21). This passage declares that the ancient pagans were “without excuse” due to the fact that they refused to apprehend certain evidence available to them by means of sense perception. Note the following. “From visible things we can and should work back (in an intellectual process) to the invisible reality of the Creator” (1985, 636). These heathen are described as “senseless” (asunetos — the negative form of a term historically suggesting “to bring together,” hence, “to understand.” They refused to use their minds logically, to consider the evidence at their disposal. They were “vain” (mataioo — “void of result”) in their “reasonings” (dialogismos — lit. “to bring together,” then “to question, doubt”), i.e., they were bereft of “the proper use of reason and logic” (Cottrell 1996, 145). J. B. Lightfoot characterized this sort of disposition as “intellectual rebellion against God” (1953, 117). These expressions, and many others employed in the New Testament, clearly demonstrate that the use of evidence in concert with valid reasoning is the correct process in coming to a knowledge of divine truth. When the newly-converted Saul of Tarsus began to proclaim Christ as Lord, to the Jewish population of Damascus, he “confounded” them by “proving” (sumbibazo — “to bring together,” i.e., “to demonstrate”) that Jesus is the Messiah (Acts 9:22; see Thayer 1958, 596). The apostle would have cited prophecies from the Old Testament, comparing these with the facts relating to the Lord, e.g., his birth, miracles, teaching, character, death and resurrection, etc. Evidence was always an integral part of the primitive gospel case. When the citizens of Berea were exposed to the message of Jesus, they were characterized by a certain nobility, because they took the facts preached by Paul and his companions, and they “examined” (anakrino) them to determine whether or not they were true. The verb signifies “exact research as in legal processes” (Robertson 1930, 275). Unquestionably, the gathering of evidence was an essential element of this process. Are the Gospel Records Hearsay? To suggest that the Gospel accounts are “nothing more than hearsay” is truly an intellectually irresponsible assertion. One might as well dismiss the evidential value of all historical literature. Thus, antiquity becomes a mere “black hole,” from which no reliable illumination escapes. Banished, then, are the writings of the Greek, Roman and Jewish historians, and our knowledge of ancient history virtually is nil. Whenever the writings of the New Testament are checked, by the most rigorous standards possible, they pass with flying colors. A classic example illustrating such is Sir. William Ramsay’s volume, The Bearing of Recent Discovery on the Trustworthiness of the New Testament (London: Hodder & Stoughton, 1915). Biblical faith, therefore, is not a wispy, leap-in-the-dark, existential experience. It is a quiet confidence, based upon the evidence that relates to the case, appeals to the reasonable mind, and results in trust and obedience. For a more thorough consideration of this matter, see Appendix (V), “The Use of ‘Believe’ In Acts,” in our commentary, The Acts of the Apostles from Jerusalem to Rome (Stockton, CA: “Courier Publications”, 2005, pp. 415-18). Are Logic and Scripture Compatible? Cottrell, Jack. 1996. Romans. Joplin, MO: College Press. Lightfoot, J. B. 1953. Paul’s Epistle to the Philippians. Grand Rapids: Zondervan. Robertson, A. T. 1930. Word Pictures in the New Testament. Vol. III. Nashville: Broadman. Thayer, J. H. 1958. Greek-English Lexicon of the New Testament. Edinburgh: T. & T. Clark. Wurthwein, E. 1985. Theological Dictionary of the New Testament Abridged. G. W. Bromiley, Ed. Grand Rapids: Eerdmans.